Grosset & Dunlap, 1935. Light green cover with yellow lettering. Slight darkening inside front and back covers at spine; otherwise very good.. Hard Cover. Farrar & Rinehart, 1938. 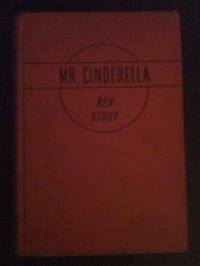 From the dustjacket: "When Rex Stout turns to romantic comedy the same factors which raise his mysteries above the general run are present. Tully Clinker was a confirmed bachelor, a hardworking chemist, a devotee of prize fights. He didn't know when he invented a new lipstick for Flora Brent, that she would happen to kiss a promoter named Jones, who in turn would send Petra Gann to get the formula from Tully by some means or other. This was only the beginning. Matters became worse when Tully found a large picture of himself in the papers, labelled 'Mr. Cinderella.' (We suspect he'd prefer to be called 'Butch.') Before he quite knew what it was all about, he had won and lost two girls and a few hundred thousand dollars, but he straightened things out in the end. Rex Stout's restless energy, his delight in living, and his gift for dialogue are again shown in this entertaining story, as they are in his ever popular mystery novels." Red cover with black lettering. Spine darkened and cover worn. 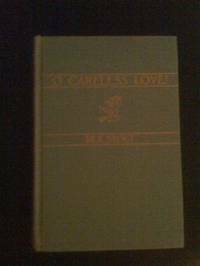 Flap of dustjacket pasted to inside front cover with original price of $2.00 and stating "Second Large Printing." Library markings and pages yellowed but still intact with no tears.. Hard Cover. Ex-Library.